The Queens Hotel in Keswick has just been bought by Lake District Hotels Limited, moving the reins from one local family to another. The deal was overseen by Daniella Hope who recently became a Director at Lake District Hotels; it is the first time she has been closely involved in a hotel purchase. The Queens Hotel is located in the middle of Keswick and was built in 1825. It has 35 en-suite bedrooms, a lounge bar and the Queens Head Café Bar. For over thirty years it was owned and run by the Peter and Catherine Williams who entrusted the management of the hotel to daughter Rebecca and son-in-law Paul Grindley when Peter sadly passed away. The sale of the Queens Hotel to Lake District Hotels Limited means the ‘Queens’ will continue to be a family led business. The purchase was managed by Daniella Hope, Marketing Director of Lake District Hotels. Alongside her parents Kit and Charles Graves, this family team already own and run six other hotels, this latest hotel addition is the magnificent seventh. 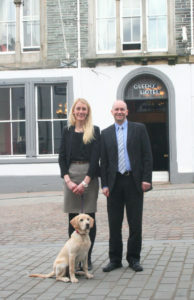 Daniella said “Keswick is our heartland and we’re very excited about the potential that the Queens Hotel offers. We already have two other Keswick hotels, but we feel the ‘Queens’ proposition is different and complimentary. It currently provides good bed and breakfast accommodation, with the Queens Head Café Bar at the back offering lunchtime and evening meals. It is a magnificent building and we will be investing substantially in a refurbishment programme later in the year to really make the most of its assets.